The first terrorism trial of a Guantanamo Bay inmate started Monday at the U.S. naval base in Cuba with jury selection at the military tribunal of Salim Ahmed Hamdan, a former driver and bodyguard for al-Qaeda leader Osama bin Laden. 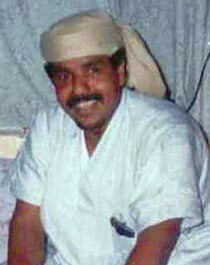 Hamdan, wearing a khaki prison jumpsuit instead of the flowing white robe and headdress he wore at pretrial hearings, pleaded not guilty to the charges against him. He's accused by the United States government of conspiracy and providing support to terrorism, and faces a maximum sentence of life in prison if convicted. Judge Keith Allred, a navy captain, then called a jury pool of U.S. military officers into the courtroom and began reading them instructions. "You must impartially hear the evidence," Allred told the potential jurors. "He must be presumed to be innocent." The 13 officers were hand-picked by the Pentagon and flown in from other U.S. bases over the weekend. Hamdan's lawyers asked whether they had any friends or family affected by al-Qaeda's attacks in the United States on Sept. 11, 2001, to see whether any should be excluded as too biased to serve. A minimum of five of the 13 officers must be selected for the trial. Hamdan's military trial is the first for any of the 775 prisoners who have been held at Guantanamo Bay since it was set up in 2001 to hold suspects in the U.S.'s so-called war on terrorism. The Guantanamo Bay prison now has 280 inmates, many of whom have been detained more than six years without charge. "It will be unlike anything that has ever been seen before, and in fact there hasn't been a war crimes tribunal like this in the U.S. since World War II," the CBC's Nahlah Ayed said from Washington, D.C.
Hamdan, a Yemeni who has admitted he was bin Laden's driver, but says he took the job because he needed the $200 monthly salary and not to become a militant, was captured in November 2001 in Afghanistan. The U.S. contends that he helped bin Laden escape capture on several occasions and transported weapons for al-Qaeda. Military prosecutors will call on 22 witnesses in proceedings expected to last three weeks and widely seen as the first test of whether the U.S. system of extra-judicial military tribunals — set up by President George W. Bush in the aftermath of the Sept. 11 hijackings — can succeed. "This is the first trial that we've had on this and it will set precedent. There are many more trials planned for the future," said E.J. Kimball of the Washington, D.C.-based Investigative Project on Terrorism. According to Ayed, "It's an extremely important case not only for the military but for President Bush himself. He did develop and institute this system back right after the Sept. 11 attacks. It has not been tested. It has been criticized severely by the international community, by Amnesty International, by other people involved in the legal community who say that it already allows for too much injustice. "For Bush, before he leaves office, it's very important to get this conviction." Hamdan's defence lawyers argue that he was a low-level employee who didn't materially contribute toward unlawful militant acts. The jury can vote to convict with only two-thirds support, whereas civilian trials require unanimity. Some hearsay evidence and coerced prisoners' admissions, banned in civilian courts, will be allowed. These terms have sparked heavy criticism from legal advocates, especially since a spate of organizations, from Amnesty International to the Red Cross to the FBI, have acknowledged that inmates at Guantanamo have been tortured. Judge and jurors will be allowed to question witnesses, not just lawyers. If the U.S. government decides that Hamdan's tribunal works well, it is expected that proceedings will be accelerated against higher-profile Guantanamo prisoners like Khalid Sheikh Mohammed, accused of being the mastermind of the Sept. 11 hijackings. Currently, the only other Guantanamo tribunal process that has made any substantial headway is the prosecution of Toronto-born Omar Khadr, a Canadian citizen who is charged with killing an American soldier during the U.S. invasion of Afghanistan. After years of pre-trial legal battles, Khadr's commission hearings are expected to begin in the fall. Hamdan's case made headlines in 2006 when his lawyers successfully petitioned the U.S. Supreme Court, in a decision known as Hamdan v. Rumsfeld, to strike down the first incarnation of Guantanamo Bay military trials on the grounds that they violated U.S. and international law. The Bush administration restarted proceedings that year by passing the Military Commissions Act. Of the 775 prisoners who have been held at Guantanamo Bay at one time or another since 2001, about 420 were released without charge, 21 have been charged with terrorism-related offences, and one has been convicted — Australian David Hicks, who pleaded guilty to providing support for terrorism and was sent back to his home country to serve the remaining nine months of a seven-year sentence.